The Brits really love their electric kettles; I have fond memories of the kitchen in my dorm in Edinburgh, where the tea flowed freely. But all that water boiling can be wasteful, you know: not only do you end up boiling more water than you'll probably use, but all that extra liquid means it takes more heat, and thus more electricity, to reach boiling. 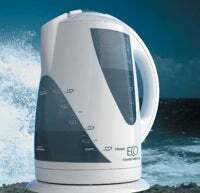 The Eco Kettle helps by moderating the amount of water actually boiled. Fill the top chamber with plenty of water, then select how many cups you want, between 1 and 8, and the Eco Kettle will fill its lower chamber with only the amount of water you need. Fantastic! As I usually boil way too much water for my morning cup of tea, perhaps I'm a prime candidate for this sucker. Then again, at a cost of almost $80, perhaps I'll just put less water in the kettle tomorrow.